As you may notice, I am not Louise! Don't worry I'm here completely innocently and was given the chance to write a guest post for her so jumped at the chance! There's this tiny little product I have been dying to review from the moment I set hands on it and so, I thought I'd do a quick review for you here. Ta, Dah! 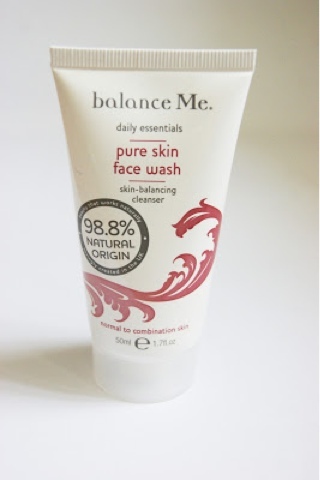 The 'Balance Me' pure skin face wash! Simply looking at it is pretty- I love the simple packaging, in a weird way it gives me the impression the product won't be full of utter rubbish! Or is that just me?! When you first apply it, it does admittedly smell of curry which, personally isn't my favourite scent for a cleanser- but each for their own! It contains Spruce Knot Extract, Anti-Oxidant Rich Rice Bran Oil and Sense Awakening Frankincense, Grapefruit and Ylang Ylang Essential Oils. All of which very natural and good for the skin. This cleanser is great, despite the scent, as it really does "dissolve" your make up without "stripping your face of natural oils". I've found that it doesn't give me that horrible 'tight face' feeling that many do- but my face still feels clean and soft. I have the 50ml bottle from a Glamour Magazine but will most definitely be replacing it with a larger one when I am finished with it, as it really has become one of my daily essentials. The prices are on the website, which I shall leave below- and certainly not bad for the product! So definitely a massive thumbs up from me! Hope you enjoyed my post and to find more of me check out my links below! I really like the Balance Me facial cream, which I got with Glamour too! I'll have to have a look for the face wash now! Ohhh I have this too, and I really love it! I got this in glamour as well! I think I really must give it another try.